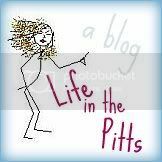 Life in the Pitts: Not bad for a bunch of college students. You guys have seen this Old Spice commercial, right? But have you seen the spoof? I found this on my friend Tara's blog, A Boy And A Girl. Oh my word! Those kids are GOOD!!! And I thought OhDoctah's spoof was funny! This one takes the prize. Ha! Just dropping by the LBS... hi there! seriously, that guy is the new BMOC... my favorite part is the closeup of HBL at the end. id rather be a ute fan (and a pack 10 school) than have a school that makes a spoof. Love it! My favorite part is when they rip his shirt off and drop the backpack on. I wonder how many times they had to do that. okay that is hilarious! I had never seen that old spice commercial and they did an excellent job spoofing it! That was amazing. I love it. ugh, i just realized that i meant to put 'alma mater' instead of 'alumni' ... how embarrassing to be quoted on such a famous blog, sounding like a doofus. guess i didn't pay that much attention to the school aspect of byu..
Those commercials crack me up! How great is that spoof! I saw this over the weekend on youtube! i love it, it's H-I-LARIOUS!!!! How funny! The first video is for me and the second, for my niece who is heading to college.